GA Telesis has announced that its current shareholder Tokyo Century Corporation (Tokyo Century) along with All Nippon Airways Trading Company (ANATC), have collectively entered into a definitive agreement to acquire all shares held by Global Principal Finance Company LLC (GPFC). Tokyo Century’s ownership after the closing of the transaction will increase to 49.2% and ANATC will acquire a 10% interest in the Company. Tokyo Century and ANATC expect the transaction to close in October 2018. 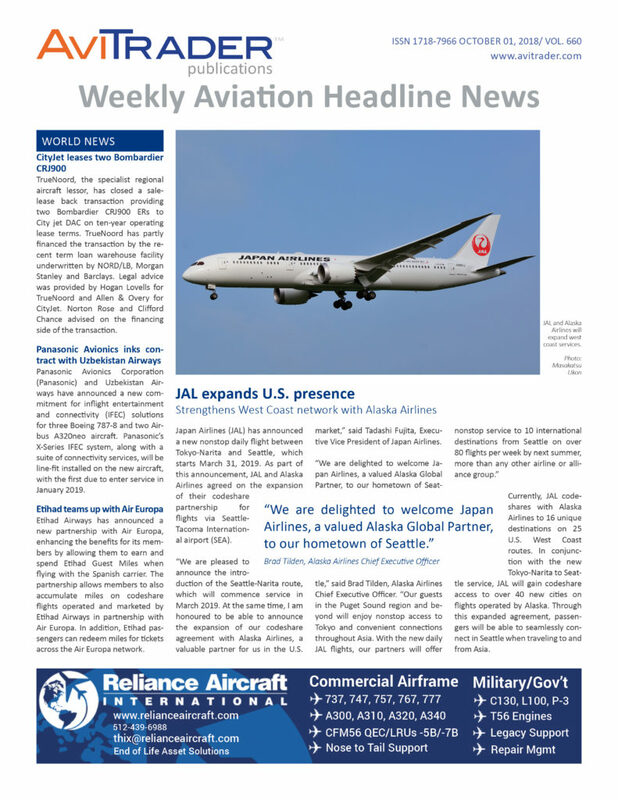 Separately, GA Telesis, Tokyo Century and ANATC have reached an in-principle agreement to form a commercial engine leasing joint venture focusing on current technology jet engines. The equity will be provided by each party and the joint venture will be managed by GA Telesis.The additional investment by Tokyo Century will bolster and further diversify Tokyo Century’s existing aviation investment platform, which also includes a 20% holding in Aviation Capital Group, the world’s premier aircraft leasing company, as well as a 16.7% position in Jetstar Japan. "Our initial investment in GA Telesis from 2012 has performed well and proven our initial investment thesis," said Koichi Nakajima, Deputy President of Tokyo Century Corporation. "We have made a commitment to our customers and the industry to provide the best services in aviation. This further investment in the Company solidifies our strategy and promise”. Established in 1970, ANATC has evolved from a service provider of aviation serviceable parts to a multinational service and solution provider that centers its business not only around aviation, but also in various fields such as food and beverages, electronics, and daily living essentials. Building on a strong customer base in Asia and other regions, ANATC strives to provide customer-centric and value-added solutions and services to its customers." "This investment in GA Telesis is the next step in our growth strategy, with a clear opportunity to profitably grow our business and better serve our customers, said Hideto Osada, Senior Executive President of ANATC. With approximately 600 employees worldwide, GA Telesis is headquartered in Ft. Lauderdale, Florida with financial services, sales, distribution operations and MRO services operations in more than 19 countries. As the leading independent provider of integrated solutions through the combination of financial services, used serviceable material supply-chain, major related MRO operations and other ancillary aftermarket services, GA Telesis continues to lead the industry by expanding the GA Telesis Ecosystem™ to include more product and service offerings to its customers. “I am thrilled with Tokyo Century’s confidence in GA Telesis and decision to increase its stake in GA Telesis,” said Abdol Moabery, President & CEO of GA Telesis. “We have had a 15-year relationship with ANATC and their investment is not only a testament to the success of that relationship but also the innovative manner in which they view the future of the aviation marketplace. With these two great shareholders, I am confident that we will continue to deliver our year-on-year double digit-growth,” he added. As the aerospace industry continues to move away from metal and steel fuselages and wings, adopting carbon fiber as a means to reduce and thus reduce fuel consumption, Aerobus, a leader in this change in construction materials has now teamed up with AMSilk to explore the potential use of Biosteel® fiber. Biosteel® fiber is identical in molecular composition to spider silk, a material known for its strength, flexibility and lightweight structure and Airbus is the first in the aerospace industry to experiment with this new material which will enable the aerospace giant to approach the design and construction of planes in a totally new way. The intention is to produce a new composite material incorporating Biosteel® fiber which will have additional shock resistance and flexibility. AMSilk produces Biosteel® fiber through a closed-loop biotechnological process that renders the product highly sustainable, with no petroleum inputs. Through this joint cooperation agreement, the two companies are hoping to produce the first prototype composite in 2019. Jet Aviation has completed its acquisition of KLM Jet Center, a leading provider of comprehensive FBO/Handling services at Amsterdam and Rotterdam International Airports. This new partnership introduces Istanbul as a destination for flybmi and offers Turkish Airlines’ passengers the benefits of flying on eight of flybmi’s European routes including Brussels to Newcastle and East Midlands; Norrköping and Saarbrücken to Munich; Oslo to Aberdeen and Hamburg; Dusseldorf and Paris to Bristol. In return, flybmi customers will be able to enjoy flying on routes from the UK and Ireland to Istanbul from 1 October 2018. The partnership will allow business and leisure travellers to book via flybmi.com and enjoy travel from Manchester, London-Heathrow and Dublin to the world-renowned Turkish metropole. Furthermore, the codeshare will open up routes within Europe for flybmi, as passengers will be able to fly on from Istanbul to Brussels, Paris, Dusseldorf, Hamburg and Oslo as part of the agreement. Following the announcement on Friday September 28th regarding the merger of the airlines First Air and Canadian North, the Board of Directors is announcing a change of leadership. The Board and Makivik Corporation have named Brock Friesen as President and Chief Executive Officer. The Board has appointed Chris Avery as the new First Air President and Chief Executive Officer. He was formerly the Vice-President of Customer and Commercial Operations at the airline. Avery joined First Air in 2017, and has taken on progressively more senior positions in his 25 years of aviation and travel industry experience, including senior management positions at WestJet, Alaska Airlines, Canadian Airlines International, and Transat Holidays. Johnny Adams will concurrently take on a greater role in the airline as Executive Chairman, expanding his role as the current Chairman of the First Air Board. Weston Aviation, the UK and Ireland based FBO and Business Aviation specialist has agreed terms to open a new Business Aviation Centre and FBO at Gloucestershire Airport (EBGJ/GLO). Weston Aviation CEO and founder, Nick Weston said "We are delighted to be opening a new FBO facility at Gloucestershire Airport and this will be an exciting addition to our network of four locations in the UK and Ireland. Gloucestershire Airport is based in a location that offers significant potential for the development of business aviation growth and activity as well as encouraging new users of private air travel to and from the region." Dubai Aerospace Enterprise (DAE) has signed a Memorandum of Understanding with Emirates Aviation University (EAU) to jointly develop cooperative learning opportunities and work experience programs for EAU students. As part of the cooperation agreement, DAE will participate in guest speaker opportunities at the University to further facilitate student learning and will support the University at conferences and career fairs. Air Partner Remarketing, has sold an ATR72-500 on behalf of Investec Bank. The aircraft, serial number MSN776, has been bought by Nepalese operator Yeti Airlines, as the latest addition to its increasing ATR72 fleet. The appointment continues a successful year for Air Partner Remarketing; earlier this year it concluded the sale of a fourth B777-200ER for Kenya Airways and its current mandates include several B777-200ERs owned by Saudi Arabian Airlines. AJW Group is set to provide full power-by-the-hour (PBH) support to Greek carrier Air Mediterranean. 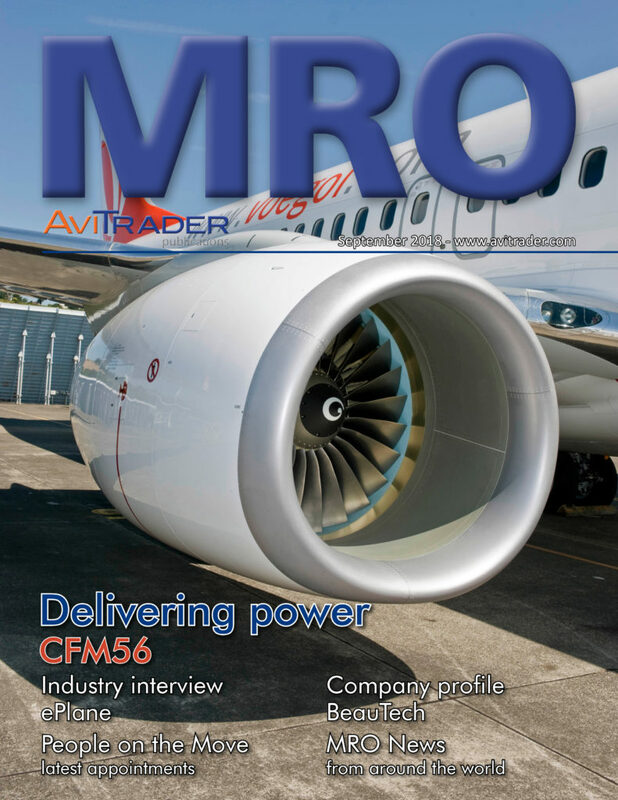 Support of its rapidly-growing B737-400 fleet and the augmenting of its dispatch reliability has started as the airline looks to expand. Air Mediterranean is an airline, which began commercial operations in January 2017, operating out of Athens airport and offering both charter and scheduled services within Africa, Europe and the Middle East. The multi-year PBH contract recognises AJW’s global reputation in the marketplace and the company’s willingness to be flexible and support start-up airlines with their supply chain management solutions. Qatar Airways has upsized five A350-900s currently on order to the bigger A350-1000 version. This latest endorsement for the largest member of Airbus’ successful A350 XWB family reflects the five-star-airline’s need for growth and capacity at best comfort and efficiency levels available. Qatar Airways’ A350-1000s features the unique Qsuite – the airline’s signature business class seating that offers a new level of innovation for in-flight comfort. With 76 aircraft on order, Qatar Airways is the largest A350 XWB customer and currently operates 30 A350 XWBs comprising of 27 A350-900s and 3 A350-1000s.